Nobody in tennis is surprised by Andy Murray's split from coach Amelie Mauresmo, says Serena Williams' coach Patrick Mouratoglou. British two-time Grand Slam winner Murray, 28, and Frenchwoman Mauresmo, 36, mutually ended their two-year working partnership on Monday. "Everyone knows everyone in the locker rooms and players' lounges," said Mouratoglou, who has coached Williams to eight Grand Slams since 2012. The Frenchman told BBC Sport that tennis has "codes" which "everyone" knows "how to interpret". And Mouratoglou pointed to Mauresmo not being in the players' box at the Miami Open in March, where the Scot went out in the third round while making 55 unforced errors against Grigor Dimitrov. In a joint statement about the end of their association, double Grand Slam champion Mauresmo, who gave birth to her first child in August 2015, said dedicating time and travel "has been a challenge". Murray, who lost his number two ranking to Roger Federer after his defeat by Novak Djokovic in the Madrid Open final on Sunday, credited Mauresmo's "calming influence" and added: "We will all miss having her around." Murray was previously coached by former world number one Ivan Lendl, under whom he won the 2012 US Open and 2013 Wimbledon titles. "The only time in his career when he could find this extra thing to win those matches against the top three and win Slams, the Olympics, was when he was with Ivan," added Mouratoglou. Since becoming the first leading male player to employ a female coach in June 2014, Murray has won seven titles - including his first two on clay - and led Great Britain to the Davis Cup title - but failed to add to his two Grand Slam titles. 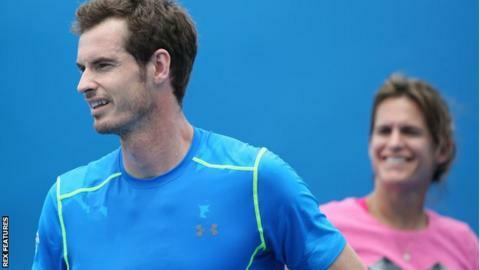 Swedish former world number four Jonas Bjorkman also left Murray's coaching team in December. Former GB Davis Cup captain David Lloyd told BBC Radio 5 live he did not think there was another female coach with "the quality he needs" and tipped "solid" current Davis Cup captain Leon Smith as a contender to be Murray's new coach. Lloyd said the decision to appoint Mauresmo was a "very, very brave move", which "worked in a way", but added that the timing of the split was "not great" before the French Open later this month.